In order to begin your dream of owning a food truck, you will first have to decide what type of truck will best serve your business. Will you be choosing a food truck, trailer, or cart? Each has its own distinguishable qualities and benefits for different mobile cuisine businesses. You’ll also have to consider buying or leasing, what food you’ll be serving, and storage. Food trucks offer space and room for flexibility. The average food trucks usually range anywhere from 14 to 34 feet in length. The large space gives you room to cook your meals there and serve them. However, depending on the length of your truck and the features, you may need to prepare your food elsewhere, such as, at home or at a commissary. Food trailers combine feature of both the food truck and food cart. They are similar to food carts as you’ll need to tow them to your destination. Similarly, a trailer has plenty of room like a food truck. It will most likely have a good-sized kitchen and plenty of space for storage. A trailer allows you to serve a large crowd and keep cooking. Often beginners decide to start with a food cart, as they are small with low maintenance. They are quite simple and you can attach them to your car and tow them to your designated area. When you choose a food cart, you should be okay with having a small working area, if not, this isn’t the vehicle for you. Additionally, if you want to serve large amounts of food at once, that won’t be possible with a food cart. Now that you know the options available to you, consider the following to determine which is best for your mobile food business. Think about what you plan on putting on your menu. Think through the entire process, from chopping, grinding and cooking. Then make a list of all the tools you’ll use, be it tongs, spatula, bowls, measuring cups, etc. Then consider your storage options, this has to include where you’ll place your ingredients, tools, and equipment you will use when cooking. If you planned to start small and later expand, think about this when doing your menu and storage plans. This way, the expenses you’ll make when expanding your cuisine won’t include the storage space and equipment as you already have them. Depending on what’s on your menu, you may have the option of preparing your food elsewhere and just selling it on the truck. Also, some cities have health laws against food trucks preparing and storing food in the truck. If that’s the case in your city, you can use a commercial kitchen, and you won’t need a lot of equipment or preparing space in your food vehicle. You can also prepare your meals at home if that’s your forte. This can save you time and money from having to go to the commercial kitchen to prep your meals. However, if you decide to prepare and cook your meals on your truck, you need to ensure you have the proper appliances and storage capacity to do so. Before choosing a food truck, trailer or cart, make sure that you have the capital to purchase a well-maintained vehicle. Your vehicle’s appeal and how it sounds drives your business, therefore, make sure your truck is worth it. You should make sure that you are willing to pay for maintenance, and care for it. Because if it has a mechanical issue, you won’t have business on that day. Do the math and decide whether you will buy a truck to own or if you’re going to lease it. The food truck business is all about location, and if you choose the right place, you’ll never go wrong. Select a place that will draw people to your food truck. Small carts are the most mobile and don’t require tons of space to set up shop. Larger trucks require more space and planning, as you can’t just park them anywhere. As always, check your city’s laws and regulations on food truck parking and permits to ensure you find the best spot for your business. You may find that your city has stricter regulations for carts selling on sidewalks than parking for trucks, or vice versa. 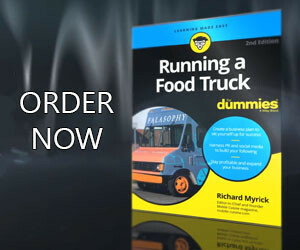 Think about who you are targeting, and this should be done way before you purchase your food truck, cart or trailer. If you have a menu in mind who will it appeal to? Which demographic are you targeting and where will you be able to sell to them? This way, you’ll know what style and design of the truck you’ll purchase. How many people will you serve daily? With success, you are going to be serving tons of people each day, and if you plan on offering catering services, you need to know where you are going to store your ingredients and equipment. Plan ahead by having a large truck with tons of storage space as this will meet the demand of feeding a large group. Plus, you if have enough space to store extra ingredients, you can serve through rush-hour without running dry. This might not be possible on a cart, as you don’t have large storage or preparation space. Consider how many employees will be working. Do you want to man the truck on your own or have several employees to help you? If you plan to have a cashier, and three chefs you need to have the kitchen space that can hold all of you without it being too crowded. When selecting a food vehicle, look at the layout and how your people are going to maneuver when they’re cooking, cleaning the dishes or preparing the meals. If you decide to purchase a food truck, remember that there needs to be enough seatbelts for everyone riding in the truck. If it doesn’t, you need to get them installed or fixed, or plan for your employees to get to the food truck’s location another way. Choosing a food truck, trailer or cart is a huge decision. Use these tips to help you make an informed choice. British Solomon is a contributing writer and media specialist for California Cart Builder. She regularly produces content for a variety of food and entrepreneurial blogs, based around the importance of food management and safety practices.